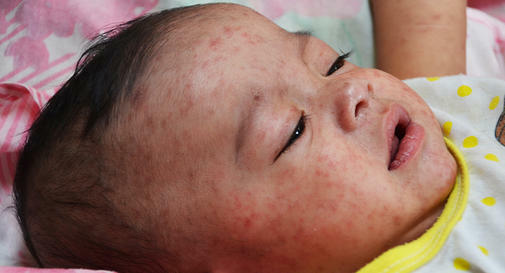 The childhood roseola is distinct from roseola adult (rash febrile adult who may be particularly syphilis, a sexually Transmitted Disease (STD)). The infantile roseola is still called 6 Th disease or exanthem sudden. It is a disease of early childhood, usually benign and healing in a few days. Roseola is caused by a virus of the herpes viridae group, HHV 6. – if the child’s behavior changes (poor tolerance to fever: confusion, vomiting, even convulsions). Cases of hepatitis, meningitis or meningoencephalitis and thrombocytopenia (platelet decline) have been reported in rare cases. – Ganglions in the neck. Then the eruption usually appears towards the 4 Thday, when the fever tends to decline. It is characterized by small macules (flat spots) pink that do not itch, on the face and trunk. Then the rash can spread to other parts of the body. The rash also lasts about 4 days. Sometimes there is no rash or it can be very fleeting, or conversely, the rash can appear with little fever and the latter can sometimes go unnoticed. The incubation oscillates between 5 and 15 days. Roseola is most often benign and heals in a few days. The childhood roseola occurs usually during infancy before 4 years, usually within two years, with a peak incidence between 6 and 13 months. It is estimated that 90% of 2-year-olds were infected with the virus before entering Kindergarten. The community life (nursery, daycare, school …) is the main risk factor for infection with roseola. HHV6 is most often transmitted by secretions from the nose and throat. The contagion is done by exchange of glass, sneezing, postillion, etc … So ask the children to put their hands in front of their mouth sneezing, but also avoid letting them exchange their glasses. The roseola is a viral disease, antibiotics (active only against bacteria) is therefore unnecessary. The treatment of roseola is therefore the management of fever, which lasts an average of 4 daysand then decreases. Give baths at about a degree Celsius below its temperature (ex: bath water at about 37-38 ° C in case of fever at 39 ° C). It is best to keep the child at home during fever and rash if attending a nursery or school. In case of poor tolerance of fever (confusion, lack of appetite, vomiting, convulsions, etc …) do not hesitate to consult his doctor again. Follow the instructions of the doctor, who will generally prescribe paracetamol (Doliprane syrup) in 4 doses (pipetted doses depending on the weight of the child), at the maximum dose of 60 mg / kg / day. If the fever is poorly tolerated and the child is more than 3 months old, the doctor may prescribe ibuprofen (Advil syrup) in 4 doses (pipette doses depending on the weight of the child). At the maximum dose of 30 mg / kg / day. Ibuprofen should not be used in a dehydrated child.